Patients are often anxious about planned medical interventions, and those experiencing anxiety are less likely to have the confidence to collaborate with healthcare professionals on their plan of care, and make decisions about consent. They may also find it challenging to follow rehabilitation guidelines, which can affect their long-term recovery. 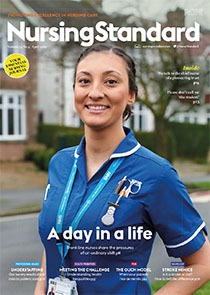 As part of their professional duty, nurses are required to recognise when people are anxious or in distress and respond compassionately, and while acquiring valid consent for any planned medical intervention requires the nurse to explain any risks, they should also attempt to reassure patients. The anxiety that precedes a planned medical intervention has been described as state anxiety; this refers to feelings of discomfort and uncertainty that accompany a situation such as an operation or a diagnostic procedure. Nurses can attempt to reduce any anxiety that patients experience by explaining the planned medical intervention and providing accurate information at the optimum time. This article outlines some of the coping theories that nurses can use to support patients in managing their anxiety about planned medical interventions.